Richard Sherman always draws a lot of attention. 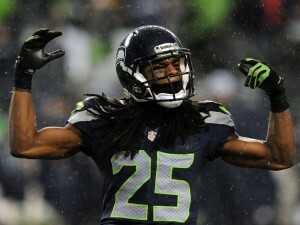 After the Seahawks win over the San Fransisco 49ers, the cornerback blew up and said, “I’m the best”. He also called out Michael Crabtree and even called him a garbage receiver. This was possibly one of the funniest interviews I’ve ever witnessed. Erin Andrews from Fox didn’t even know what to say or do after Sherman went crazy, and left it off with a laugh. If I can find the video I’ll be sure to put it up, because I’m sure it will trend and go viral! Update: I found the video on YouTube! Share this if you think it’s hilarious. Richard Sherman: Well I’m the best corner in the game. And when you try me with a sorry receiver like Crabtree thats what the results are going to be. Don’t you ever talk about me. Richard Sherman: Crabtree, don’t you ever open your mouth about the best or I’m going to shut it real quick. Sherman put an ugly stench on a sweet night for the Hawks, no doubt about that. That’s a yappy big-mouth DB for ya. @Playon:disqus, I’m sure that’s true, but he still was embarrassing. Andrews was really unprofessional. She acted snobbish and shed a negative light on an entertaining outburst. She also didn’t even know who Sherman was referring to. She obviously wasn’t cut out for it. Sherman was acting foolishly. He has consistently behaved foolishly with out of control trash talk. Entertaining if you find WWF type interviews entertaining, but not my cup of tea.